Please refer to our stock # 11529 when inquiring. This wonderful vintage pin from the 1960's is commonly known as a "powder puff" pin and is featured in the book, "Jewels of Fantasy" by Deanna Farnetti. 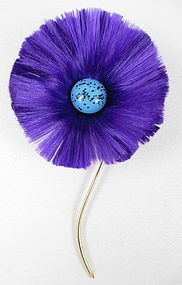 It is almost 6" long and has a 3" diameter flower made from purple fibers much like a paint brush. The center cabochon is speckled glass in a shade of robin's egg blue. It has a gold tone backing and it is in excellent condition. Michelle Obama and Sara Jessica Parker have both been seen sporting the same pin in different colors.